Italian Varnish is not a picture varnish but rather a gel oil painting medium. Italian Varnish was first mentioned by Jean-François-Léonor Mérimée in his 1839 book, The art of painting in oil and in fresco, as a “strong oil prepared in Italy from a very remote period, and which possesses the double-advantage of drying well, and preventing the flowing about of the most liquid glazing.” Italian Varnish is made using linseed oil, litharge (lead monoxide), wax and a small amount of gum turpentine, ground as fine as possible. We have made it with some improvements to the method and materials given in the recipe by Mérimée. It is an amber gel medium that performs similarly to Maroger medium, except instead of mastic, this medium incorporates wax, which is ideal for those artists who prefer a thicker painting consistency and faster drying time. 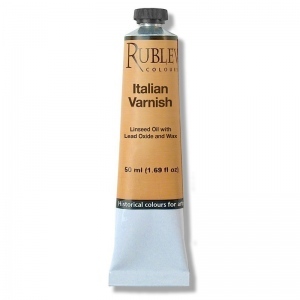 Italian Varnish sets quickly, while providing translucency and body to oil colors when mixed with them in glazes. It gives a somewhat fluffy consistency to paint, making possible many different ways of using this subtle technique. In addition to the soft sheen of the medium, the artist now also has the means of more rapid execution. Artists can mix the Italian Varnish into light pigments (Lead White, Lead-Tin Yellow, Naples Yellow, Yellow Ocher, etc.) to give these colors more body and a thicker consistency. It can help to build up the lights and adds translucency and impasto for the brightest passages of a painting. DO NOT APPLY TO SURFACES ACCESSIBLE TO CHILDREN OR PREGNANT WOMEN. NE PAS APPLIQUER SUR UNE SURFACE ACCESSIBLE AUX ENFANTS OU AUX FEMMES ENCEINTES. Must be used exclusively for the purposes of arts, crafts or hobbies but not as material for use by children. California Proposition 65: This product contains a chemical known to the State of California to cause cancer and birth defects or other reproductive harm.